When we apply Barna’s research, out of 155 million people now in the workforce, only 8 million approach life with a biblical worldview. For almost 20 years I worked in a variety of workplaces before I ever experienced a boss who not only had a biblical worldview, but also applied it to business decisions. Because that man applied God’s Word to his approach to business, it changed my life! His unconventional approach to business at first intrigued me, then it began to change me. 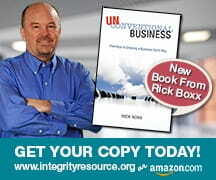 If you desire to make a difference in your workplace, become an unconventional business leader. Learn and practice God’s Word and you too will change lives and transform workplaces.